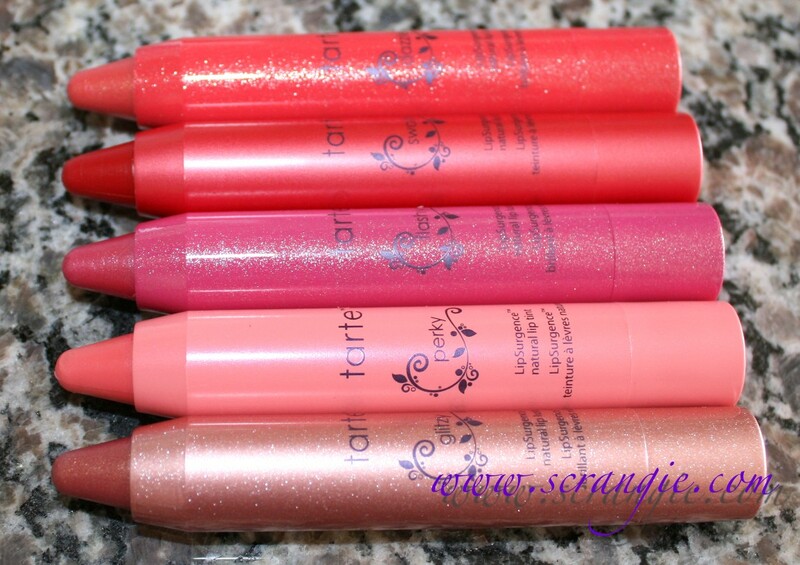 I've been wanting to try these Tarte LipSurgence™ (tee hee, I love typing that little ™) pencils since they first came out, but there was no way I was paying $24 for one of them. And then, lo and behold, this set shows up at Sephora. 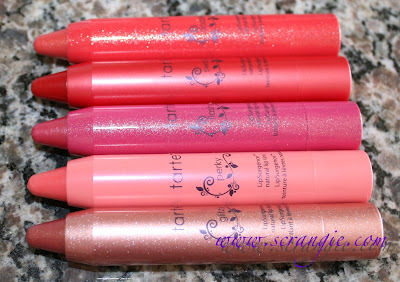 Five full size LipSurgence™ (man, that will never get old.) 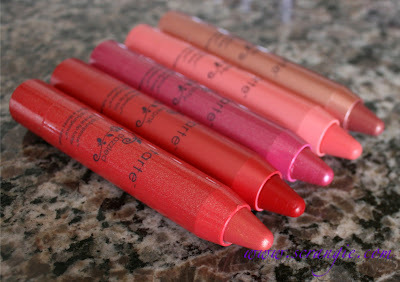 Natural Lip Tints for $29 (!!). So, yeah, of course I ordered it. I felt like that guy on the DirecTV commercial with the tiny giraffe. Look at that shiny, glittery package. Oooooh, aaaaah.... You know how I am with shiny glittery things. 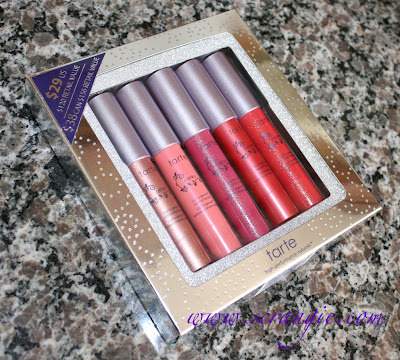 The set comes with five shades: Glitzy, Perky, Flashy, Swank and Dazzled. These shades are exclusive to this set. Look how pretty the tubes are! They're all glittery and iridescent. These are twist-up pencils, by the way; no sharpening necessary. Closeup of the shades: Glitzy, Perky, Flashy, Swank, Dazzled. 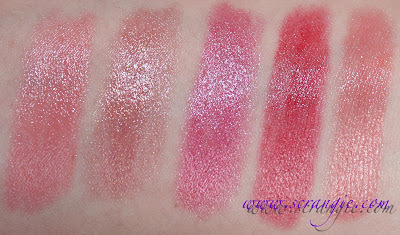 Swatches (sunlight, flash, indoor): Perky, Glitzy, Flashy, Swank, Dazzled. One of the reasons I've been wanting to try these is because of Tarte's ridiculous claims about the benefits of these- remember the mascara that claimed to make your lashes look 638% bigger? Well, these claim to increase your lip moisture level by 6,000%. My moisture level.... it's over SIX THOUSAND! I've been using these at least once a day for a couple weeks now and I can't say that my lips feel any different or... moister (is moister even a word? ), but still... Really like these. 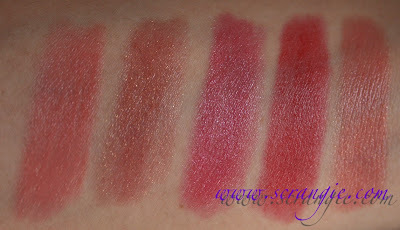 You get five full size (0.1 oz) LipSurgence™ (bahahahaha) Lip Tints for $29- and one by itself cost $24. The pencils add a nice sheer, glossy color, though not as glossy as an actual gloss. They don't make my lips feel dry like lipstick or lip stain. Nice subtle peppermint tingle when first applied. Pretty packaging, great for gifting. Really don't like the color of Flashy on me. Didn't make my lips 6,000% more moist. The peppermint scent is pretty faint. 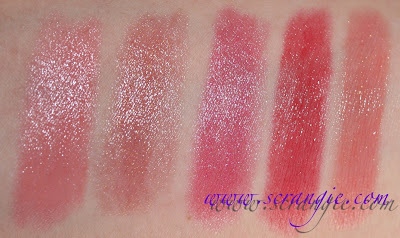 The 'sparkle'/lustre shades really aren't sparkly at all, just a subtle shimmer. I'm glad I got this set. I really like these. Would I pay $24 for one? No freakin' way. They're only 0.1 oz! But if they did another value set, I'd buy it in a heartbeat. These are easy to wear, last a long time on the lips, aren't overly dark or cakey like some lipsticks and they feel really nice on my lips. 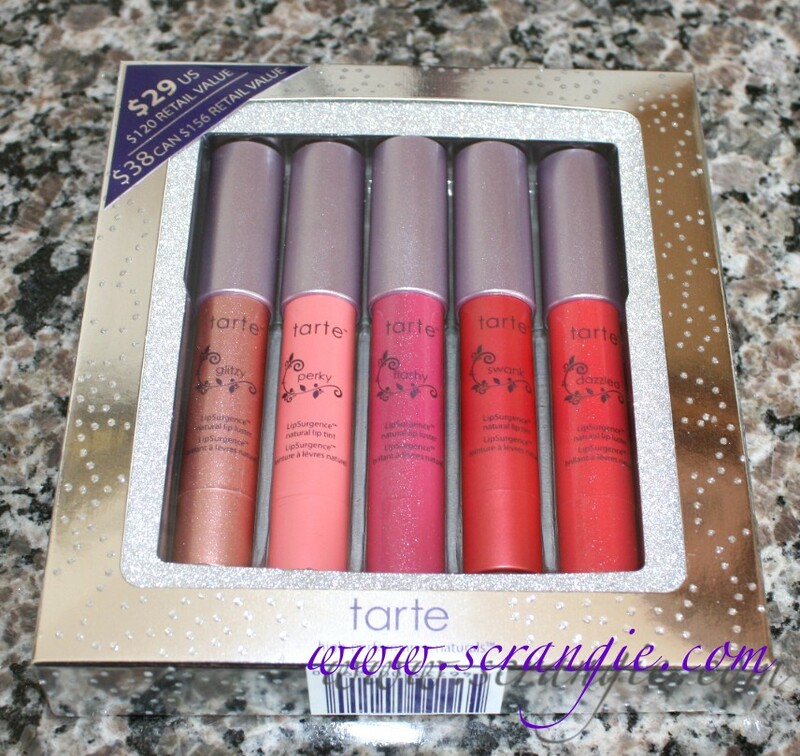 I got my Tarte Lip Service Limited-Edition LipSurgence™ Collection from Sephora. $29 for the set. Limited edition. 6,000%? Quite a bold claim. 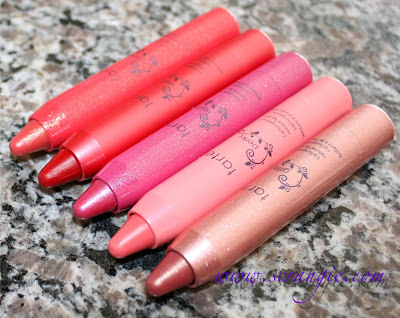 This one immediately made me think of the Milani Lip Flashes. I love those and they're cheaper so I may pass up on these but they're sure pretty to look at. Hehe, that's a crazy claim. I wonder what kind of studies they did to come up with that number. And who were the subjects they tested it on? :P What kind of lips did they have? Hmm...maybe I don't wanna know. Yeah, I don't blame you for not wanting to purchase them outside the value pack. $24 for one is really too high! I like perky and dazzled! 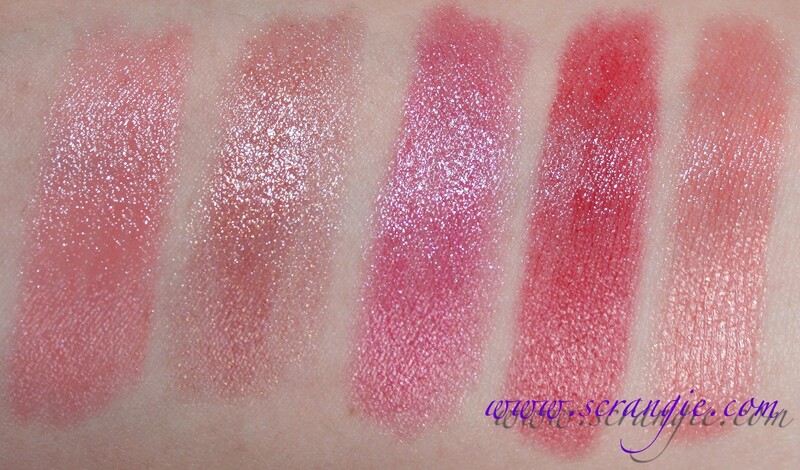 I'm so glad you swatched this! I'd been thinking about this set because I have Sweet and love it, but now I know I'm ok skipping it. Yeah...all these companies seem like they're trying to put the biggest numbers possible out there, just to wozzle people. I (and my inner statistician-gnome) are so way not buying. Oooh, I need to check these out! When you say no sharpener required, do they twist up? And LOL to the tiny giraffe! Love that shiz! 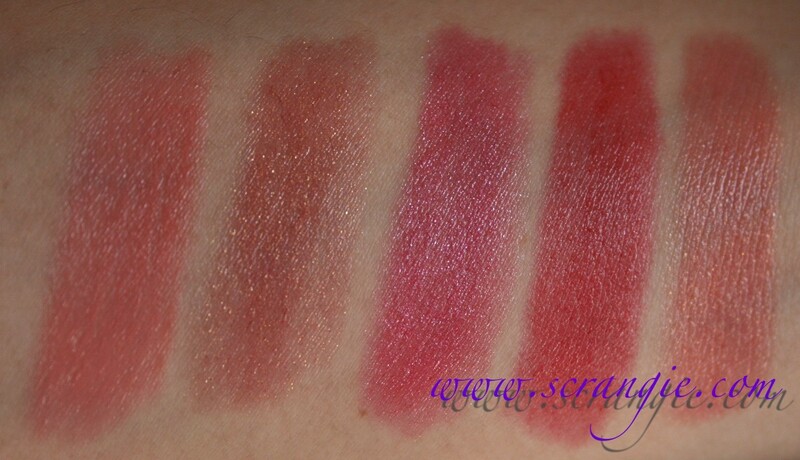 These swatches increased my desire for absurdly expensive lip crayons by 6000%. Oooo nice! I thought of you today when I picked up a Hard Candy lip gloss at walmart today that was pale pinky/clear with tons of glitter/shimmer and what looked like a bit of holo. It has a freaking CRAZY applicator though, it's the biggest, juiciest doe-foot applicator I've ever seen in my life. I don't believe any companies claims anymore. Especially when you see commercials & print ads with outrageous lashes, etc. These are really pretty. I WANT! I wouldn't pay the price for one of these. The collection I wouldn't mind paying $29. I got these and really like them. I'd say Flashy is my favorite color. For the price, you can't beat it!